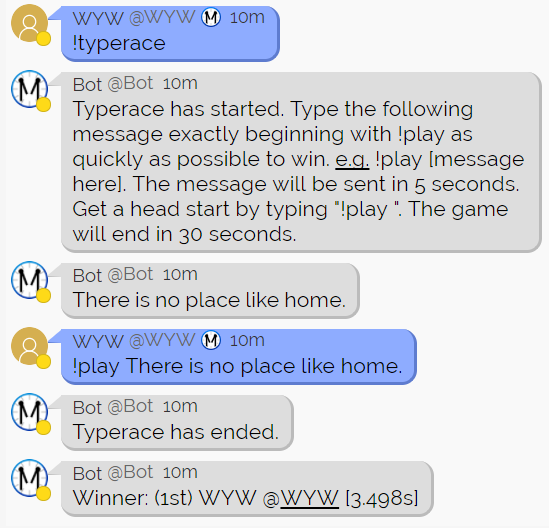 Typerace is a game where users try to type a specific message as quickly as possible. This game can be started via the bot command !typerace. When someone uses !typerace to start the game, the bot will explain the rules below in the first message. The bot then waits 5 seconds and posts the message that everyone has to type. After 30 seconds, the game ends and the top 3 replies that match are ranked in ascending order by time. The user who types the message the fastest wins! Do you have what it takes to win the Typerace? After the bot sends the message that users have to type, users can play by using the !play command (example below). Messages must match exactly in order to count. This includes any punctuation and capitalization that is in the message. Too easy? Typerace supports three difficulties! Type !typerace medium for slightly longer sentences, or !typerace hard for the toughest phrases yet. This page was last edited on 25 December 2017, at 06:23.